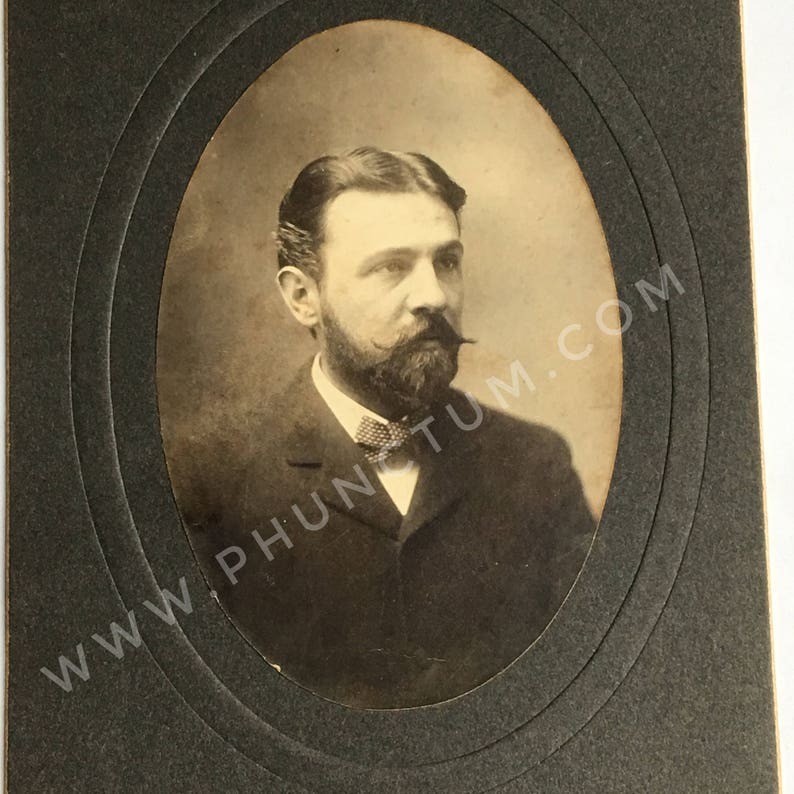 Fantastic antique card-mounted photograph (ca 1890s) shows a handsome young man with a great waxed mustache. On the back is written "Dr. Riggs" - first in pencil, and by a later hand in ink. Photo was found in Kansas, and my online research leads me to believe this photo is of Elmer Samuel Riggs, noted American paleontologist (please see a comparison photo here: https://www.gettyimages.com/detail/news-photo/paleontologist-elmer-s-riggs-poses-for-a-portrait-with-a-news-photo/450344314#paleontologist-elmer-s-riggs-poses-for-a-portrait-with-a-newly-skull-picture-id450344314). Card mounting is 7" tall x 5" wide with oval photo; good vintage condition with corner bumping to mount and edge wear to mount and photo. Photo shows slight foxing, soiling and wear. Small area of surface loss on back upper right. Watermark doesn't actually appear on photo. Visit my shop for more great vintage and historic photographs, real photo postcards and tintypes! Heeeeee! I love it. I love the image. It just tells such an interesting story. What a cutie. Thank you so much! I love everything! Perfect shopping experience. Adorable, thank you! Super fast shipping and packaged with great care. As Phunctum deals almost exclusively in vintage & antique items, nothing will be "like new." I strive to mention any wear, soiling or flaws. However, since condition is often subjective, I will also do my best to provide detailed photos or scans for your examination. But please contact me with any problems or concerns ~ I do want your experience with Phunctum to be memorable - in a GOOD way! It is the buyer's responsibility to provide their correct shipping address! I love multiple-item orders & happily refund any combined s/h overpayment in excess of $1. Unless otherwise specified, Phunctum generally ships via USPS once a week, usually on Fridays. All items are carefully packaged for safe shipping - I want things to arrive to you in the same condition in which they left me. Please let me know if you desire to purchase insurance. I do often use recycled packaging, but pack to hold up to heavy handling & inclement weather. ***INTERNATIONAL SHIPPING is available on all items - Just Convo me for a quote, if not already listed! *** I'm happy to ship internationally. Please note, however, that Phunctum is not responsible for any VAT/Customs fees that may be related to to your order nor will we help you in illegally circumventing these fees if they are applicable to you. Falsifying customs declarations or having an item marked as "gift" in order to avoid customs fees is classified as Mail Fraud and is a felony. While my home is smoke & pet free, please remember that the items I sell lived somewhere else for many years before they came home with me! Post mortem images are difficult for most of us to look at, and today are often seen as macabre. This is the reason for the warning photo I often insert as the first image in a listing. However, in the late 19th & early 20th century people were, if not less afraid of death than we are now, then at least more accustomed to it. In Victorian and early Edwardian times the infant mortality rate was high and life expectancy in general was far shorter than it is today. Photographs were expensive, and mostly reserved for special occasions. In many cases, no photograph of a loved one (especially a child) existed before they died, so having a portrait made after death was a way to hold onto a visual remembrance of them. Even a sad memory was better than no memory at all. By the early 20th century mortality rates began to lessen. Many people could afford their own cameras and were able to photograph family members while alive. Having portraits of the living made post mortem portraits unnecessary, and they became less and less desirable. Today most large hospital neo-natal intensive care units will offer to take a picture of parents holding their deceased infant. Some professional photographers even donate their time to the Now I Lay Me Down to Sleep Foundation, which helps grieving parents through the loss of their stillborn or infant children by giving the gift of professional portraiture.